This timeline and wedding information is based on a real wedding on May 5, 2018 in Millers Creek, North Carolina. I wanted to share this bride's timeline with you & a few details of their day that made it go so smoothly! #1 - First off, she chose to hire a wedding professional to help her decorate the venue, coordinate the ceremony, and continuously kept an eye out for things that could negatively impact their photography. This lady took SO much off my shoulders. It was a miracle that everyone was where they were supposed to be, nothing ran late, and I didn't have to move A THING to make it photograph prettier. Because of this angel, I have 300 extra images to deliver to this couple. I HAD THAT MUCH MORE TIME!!! And, I had time for a lunch break! I feel that since a large amount of stress was lifted by their planner, I was able to focus on my primary job - PHOTOGRAPHING! I caught SO many moments that I typically miss because I'm playing the role of a coordinator and many times, a decorator. I was able to laugh with their family and friends and get so many genuine smiles. #2 - Another thing that made this wedding so wonderful is that no one was drunk while trying to take photos, or while getting ready. This is actually very rare at weddings. The bridal party typically wakes up, they are excited, and start celebrating when the sun comes up. While we want your bridal party to have a wonderful time, this could negatively impact your photography investment. Another reason that this couple was able to get so many extra images is because their bridal party..... simply waited to party. Thanks bridal party. You were amazing. #3 - You will see in their real timeline below that they chose to do a first look and do ALL of their portraits before the wedding. This made the day so relaxed and we had the option of 2 hours of bride and groom only photos!! That is how long we shoot an engagement session for and how much time we need on a wedding day. After their first look, they prayed together privately and then invited their family to join in. It was the sweetest way to start their wedding day. And we always get told by brides that they want a REACTION from their grooms. You can see his below when he saw her for the first time. First looks actually allow grooms to be relaxed enough to show emotions because they don't have an audience. So, if thats something you love the idea of, a first look should be in your timeline! #4 - Gabby and Aaron chose a location that accommodated their ceremony and reception. There was NO drive time or worry about traffic. 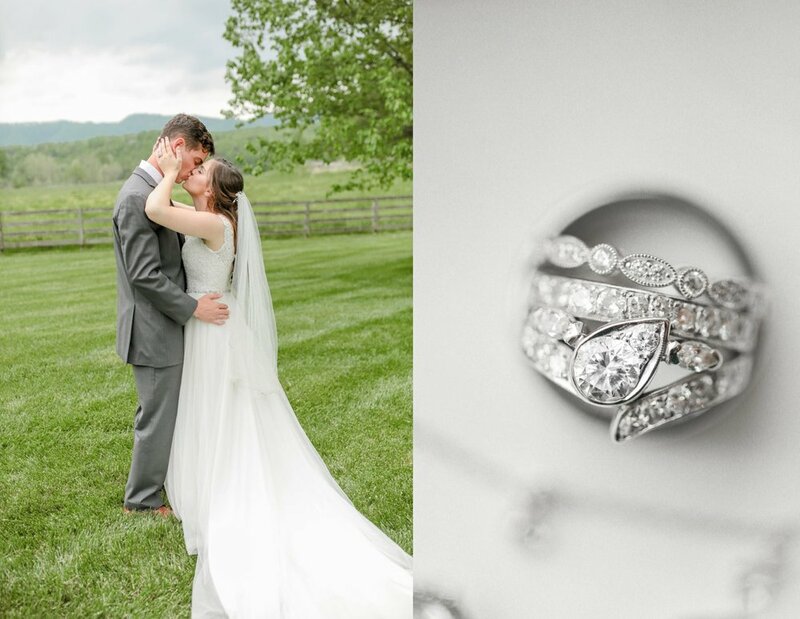 Fussell Farm was a blessing when it came to their on site bridal suite & grooms den too! Being on the same property the entire day allowed Noah and I to hop between the bride, the groom, the ceremony spot, & the reception. There will be times when the brides hair takes a little longer, or a button on the dress isn't cooperating, the veil got wrinkly and it needs steamed... Whatever the case may be. When things like that happen, we have the flexibility to photograph something else so your timeline isn't affected later in the day. Did you notice the butterflies? Noah had been trying to film one all day, and as the family bowed their heads to pray, they all peacefully landed in the flowers around the pavilion. It was perfect.